The set features the complete adventures of the Eleventh Doctor - every season, every special, every episode. 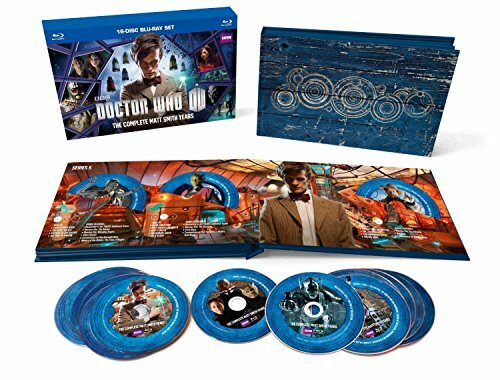 It also includes, for the very first time on a special bonus disc, Doctor Who Proms 2013, The Day of the Doctor: From Script to Screen, The Five Doctors Reboot and Doctor Who: The Ultimate Guide. And it wouldn't be a complete set of Matt Smith's appearances without also including the two part special Sarah Janes Adventures: The Death of the Doctor. New York - September 17, 2014 - BBC Home Entertainment is pulling out all the stops with one massive collection in honor of the Eleventh Doctor and the man who portrayed him with the release of Doctor Who: The Complete Matt Smith Years Limited Edition Blu-ray Gift Set, landing on shelves in time for the holidays on November 4, 2014. Matt Smith made his first appearance as the Doctor in 2010, and went on to star in three seasons of the iconic British sci-fi series, written and executive produced by Emmy(R) and BAFTA winner Steven Moffat (Sherlock, The Adventures of Tintin). * Doctor Who at the Proms 2013 - It's always a thrilling night when the BBC's annual classical music festival, the Proms, features the music of Doctor Who. Hosted by none other than the 11th Doctor himself, Matt Smith, plus companion Clara (Jenna Coleman) and a fantastic assortment of special guests (and monsters), Murry Gold's iconic music from the program has never sounded better than in this live concert, which was a highlight of the build-up to DoctorWho's 50th Anniversary. * The Day of the Doctor: From Script to Screen - Witness the initial table read for Doctor Who's legendary 50th Annivesary episode, The Day of the Doctor, and then see the episode come to life on screen through interviews with Matt Smith, David Tennant, Steven Moffat and others as well as footage from the filming. It's an exciting look inside the process of bringing Doctor Who to life. * The Five Doctors Reboot - In the build-up to Doctor Who's 50th Anniversary, rumors were swirling wildly about which former Doctors would be featured in the anniversary episode itself. In this hilarious comic spoof, former Doctors Peter Davison, Sylvester McCoy, Colin Baker, and Paul McGann poke fun at the mystery and themselves in hysterical fashion. With cameos from Matt Smith, David Tennant, Jenna Coleman, Steven Moffat, Russell T Davies and others. * Doctor Who: The Ultimate Guide - Eleventh Doctor Matt Smith and companion Clara (Jenna Coleman) introduce this insightful look back at the remarkable 50-year history of Doctor Who featuring interviews with the cast and the people behind the scenes, past and present, plus a host of celebrity fans. Doctor Who - The Ultimate Guide delves deep into the history of the Doctor, profiling his many incarnations and charting the progression of his character from his old-fashioned, black and white origins to his more complex, many-layered, modern-day persona and the multi-faceted menaces he has faced through the years. This is the defining documentary of Doctor Who, the perfect way to celebrate a rich 50-year old marvel. * Sarah Janes Adventures: The Death of the Doctor - The Eleventh Doctor makes a special appearance in the spin-off series Sarah Janes Adventure. In the two part special written by Russell T Davies, Sarah Jane is reunited with another of the Doctor's former companions, Jo Grant (Katy Manning), as they investigate the fate of the Doctor at his own funeral. Things get more complicated when they're joined by the Eleventh Doctor himself in an alien-busting adventure featuring brand-new vulture aliens, the mysterious Shansheeth and a trip to an alien planet.